Major capital city it may be, but Edinburgh is a surprisingly lush place. Its extensive network of parks and gardens mean you’re never far from an open space in which to escape the sturm und drang of city life. And try navigating Edinburgh on a bike or your best Louboutins, and your aching bones will soon tell you this is a pretty hilly place. It’s traditionally said to be built on seven peaks, all of them ideal for burning off big lunches and hangovers, but argument rages over which these are, as there are ten hills over 30m within the city boundaries. Arthur’s Seat, Castle Rock, Calton Hill, Corstorphine Hill, the Braid hills and Craiglockhart Hill are all green oases that are included in the annual Seven Hills race, and on top of that, in the heart of the city, there are a number of steep slopes and vertiginous streets, not to mention the staircases and bridges linking them, just waiting to test the unwary pedestrian’s head for heights. Who needs a gym when you have Auld Reekie to keep you fit? Escape the shops and slip into Princes Street Gardens. In summer it’s the perfect place to enjoy a picnic, people-watch and soak up the rays, while in winter it’s transformed into a festive wonderland, with a German market, fairground rides (including a heart-stopping Big Wheel) and an ice-rink, as well as any number of stalls selling mulled wine and hot dogs to keep out the chill. A far more secret city-centre oasis is Dunbar’s Close, which is hidden away down the Royal Mile among the wynds and cobbles of the Old Town. East of the Canongate kirkyard on the north side of the street, it’s planted with flowers and herbs and laid out in the manner of a 17th-century garden. Open to the public, it’s a peaceful place to leave the 21st century behind. One of Edinburgh’s most famous parks is The Meadows, which is split into several sections, allowing the capital’s citizens to spread out on the well-kept lawns and play pitch and putt, cricket and frisbee, skate and cycle on its footpaths, walk dogs or jog, perform tai chi or just drink tea underneath its majestic trees from dawn to dusk. 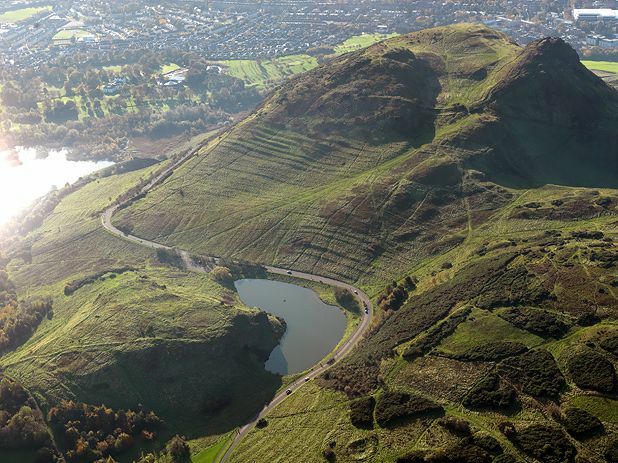 Arthur’s Seat, an extinct volcano, is the ideal spot from which to survey the city. An easy(ish) climb, it has fantastic panoramic views and is most easily tackled up the grassy slope from Dunsapie Loch in the east. Several flights of steps will propel you in a matter of minutes up Calton Hill, which sits in the city centre, with its unfinished Athenian acropolis begun as a memorial to those lost in the Napoleonic wars. Left incomplete since funds ran out (trams, anyone? ), the folly is a popular landmark poking above the skyline. There is also an observatory and Nelson’s Monument, with its time-ball mechanism by which ships used to set their chronometers. To the south of the city centre, in a residential area, is Blackford Hill, whose trees, grassy slopes and large duck pond make it popular with families. It has excellent views of the city, the Forth estuary and The Pentland Hills, plus spectacular views of the stars from the green-domed Royal Observatory near the summit. Nearby are the Braid hills, which have a lovely woodland park. And for those who like to stand back and smell the roses – as well as the other plants in one of the world’s largest living collections – the 70-acre Edinburgh Royal Botanic Garden, just a mile to the north of the city centre, is unmissable. The Saughton Winter Garden at Saughton Park also offers opportunities for a peaceful dander among the blooms.